Drawing The Daakness: In Conversation With Simon Fraser | Warped Factor - Words in the Key of Geek. How does it feel to redesign a much-loved character from fans’ history and reintroduce him to the 21st century world of Who? 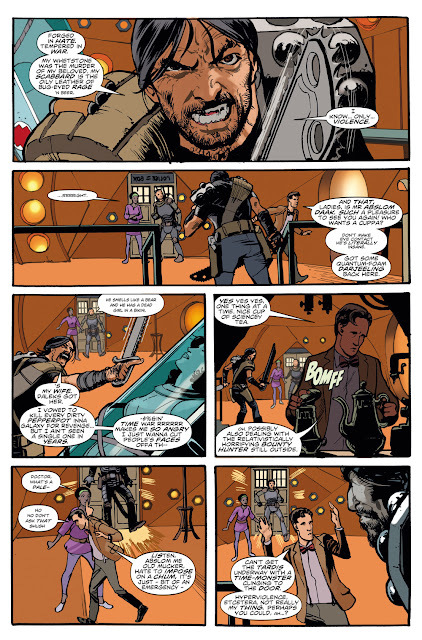 Tony spoke to Simon Fraser, one of the two main artists responsible for bringing back Abslom Daak to ride alongside the Eleventh Doctor in Titan Comics. 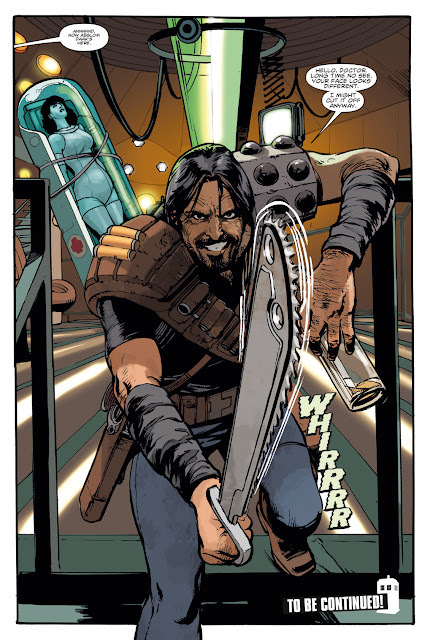 When you bring back a character with as much history for fans as Abslom Daak has, does there feel like an additional obligation to serve the character, or do you principally serve the story? Or are you aiming to do both at once? 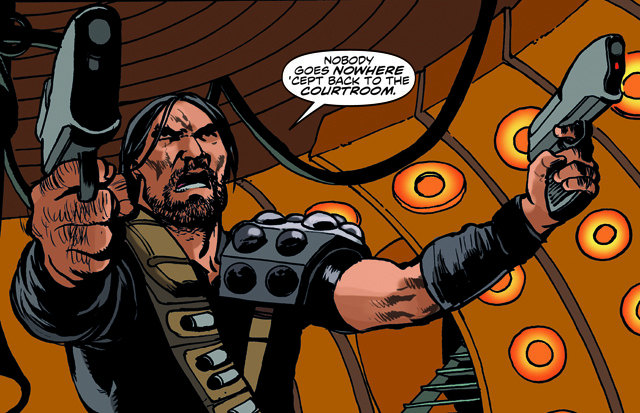 It's a huge amount of fun to be using Abslom, his reintroduction to the Whoniverse gives us a big storytelling reveal for old fans and some nerdy fun for young ones to discover. It ties together our run on the Doctor Who comics and the great work that was done on the Marvel Doctor Who Weekly/Monthly anthology from the late 70s and early 80s. There's a lot of pressure to honour the great work that Steve Moore and Steve Dillon did back then and I think we've gone to some lengths to do that. What visual challenges has The Then and the Now presented in terms of both Daak and its other elements? I felt that I had to redesign Daak a little to underline that fact that time has passed. His costume is very much of its time. However I couldn't just start from scratch. The huge shoulder pads are necessary, so I updated them a little - making the right pad look as it it's been hacked off a Dalek felt like a good addition to me. I toyed with making him a good deal older and bearded, but felt that his appearance was quite iconic and shouldn't be messed with too much. The Then And The Now character itself was a challenging character to design as it has to represent a nearly wholly-abstract idea. I opted for a cross between Op Art and Psychedelia. It's roughly humanoid so it can interact with the world in a more or less understandable way, but otherwise it's a huge monstrous special effect. How aware were you of Daak as a character before you got to draw him? I read the original comics when they came out. I was a very dedicated Doctor Who fan as a kid and collected Doctor Who Weekly/Monthly for years. It was almost a companion to 2000AD at the time because a lot of the same talent were involved. 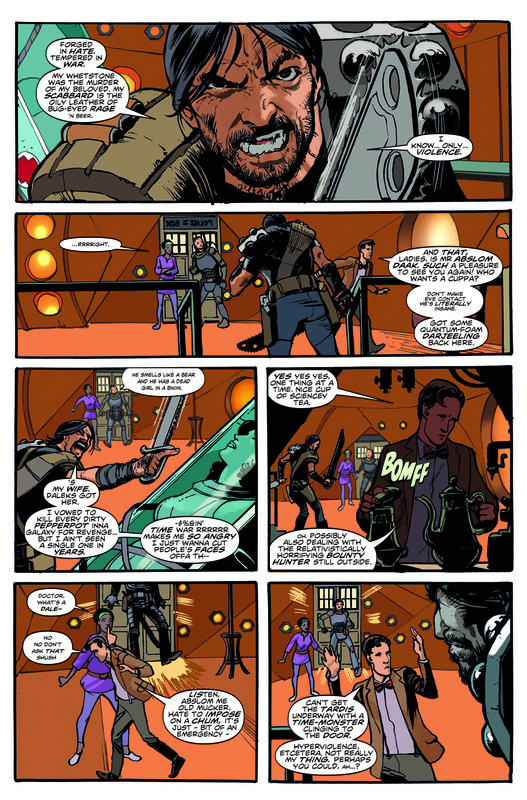 Dave Gibbons, Steve Dillon, and David Lloyd were three of my favourite artists, then the scripts were written by Pat Mills, John Wagner, Alan Grant, Steve Moore, and, of course, Alan Moore. That's some of the best talent in British comics, then and now. My original issues are still at my mother's house in Scotland. They escaped the purge of my comics collection that happened when I left home. However, in a rather freaky cosmic coincidence, I was talking to my next door neighbour up in the Catskills one evening, explaining about Doctor Who comic books. He is a great collector of things and buys a lot of weird junk at yard sales in the Catskills area. He went away and five minutes later came back with a handful of comics, Doctor Who Weekly #s 5 to 19, which include the first ever appearance of Absolm Daak from 1979. This was about six months before I heard that we could bring back Daak, so destiny was clearly working in our favour. What elements did you feel you absolutely had to nail to deliver a Daak to get the old fans excited? Daak is a simple character in some ways, he's a huge hulking brute and nearly unhinged. It's important to get his massive and threatening physicality, his brooding, unpredictable quality and the madness in his eyes. He can be funny, especially in contrast to the Eleventh Doctor, who is his exact opposite in pretty much every way. That interaction is the source of some humour throughout the story. I also like the contrast between Daak and the Squire character, though they are both warriors, Daak is a pitiless killer, largely guilt-free and the Squire a much more empathic and emotionally troubled figure. Alice is a contemporary woman and just regards Daak with utter horror. Can you give us an idea of the process – how much descriptive text do you get to see before you have to deliver the artwork? 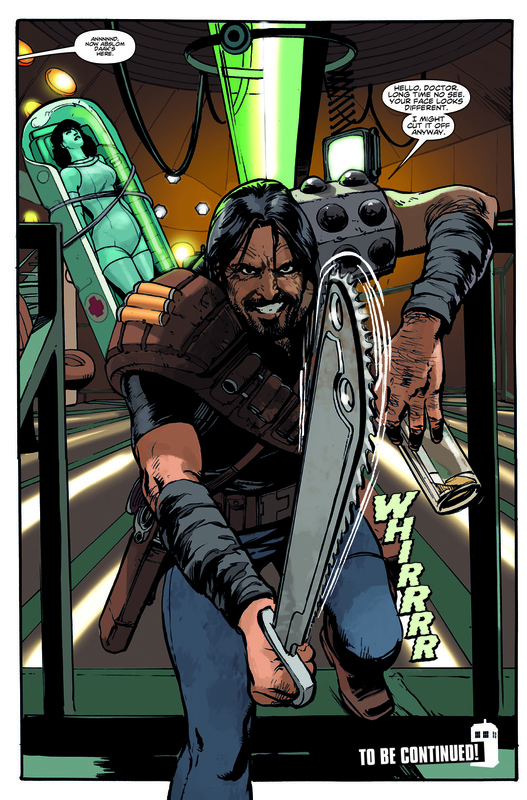 Say for the issue 1 final panel, which essentially introduces Daak into this story – how does the synergy work? Do you just get ‘Abslom Daak is standing there’ or is there more to it than that? The description of that final panel was fairly simple. We'd been discussing Daak for several months, so we were all on the same page about how he should look and behave. However I drew that page twice, rejecting the first version because I didn't feel that it had the right feel for the character. It's an important page, so I went out of my way to make sure that it looked just right. How long does, say, a poster-panel like the last of issue #1 take you to deliver? I took about two days getting it right. Not because it was complicated to draw, it's actually quite simple, but it was important to me so I went the extra mile. Simon Fraser, thank you very much.